Some 20,000 pilgrims climbed Ireland’s holy mountain on Sunday, Reek Sunday, the day of the annual Croagh Patrick Pilgrimage. The annual Croagh Patrick pilgrimage has been carried out uninterrupted for more than 1,500 years. 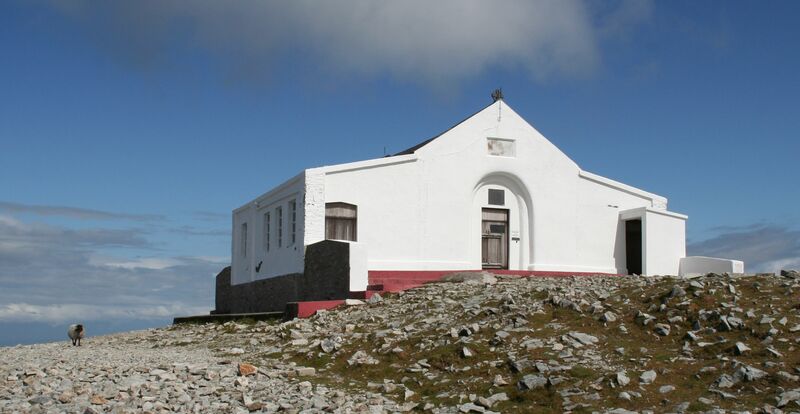 Croagh Patrick has over 100,000 visitors annually, with up to 20,000 making the pilgrimage each Reek Sunday in July. “I lift up my eyes to the mountains, from where shall come my help? My help comes from the Lord who made heaven and earth” (Psalm 121:1). For Catholic Christians, the mountains are something more than a place of beauty and refreshment and renewal. The mountains are places where we come in contact with the mystery of God: in the Old Testament, it is on the Mountain of Sinai that Moses encounters the unspeakable majesty of God and receives the Ten Commandments. In the New Testament, on the new Mountain, the Mountain of the Beatitudes, the disciples of Jesus receive from him the new law of love. The entire trajectory of Christian life is upwards, we might say. That might not be as apparent in the English language as in other languages, since in many, if not most languages – though not in English or in Irish – the word for “heaven” and the word for “sky” are the same. Indeed, they are the same in the Greek language in which the New Testament was written. So when Jesus speaks in the Gospels about our heavenly Father or our Father who is in heaven, it quite literally has the sense of our Father who is in the skies, who is above. This notion of moving upwards, of ascending, of climbing is present in our second reading this evening, although it is obscured a bit by the English translation of Saint Paul’s Letter to the Colossians. In the version which we have just heard, Saint Paul says: “Since you have been brought back to true life with Christ, you must look for the things that are in heaven” (Col 3:1), but a more literal reading of the line, and indeed a more traditional translation in English is “If you have risen with Christ, seek the things that are above” (Col. 3:1). And here we come to the key of why the notion of moving upwards, of ascending, of climbing is so central to our identity as Christians. Christ has come up out of the tomb, having descended in death even into the netherworld, as we confess in the Apostles’ Creed. Christ has risen from the tomb, conquering death; Christ has then ascended into the sky from where he will return. Each and every one of us who has been baptized is sacramentally following that trajectory, his trajectory. We have risen out of the baptismal waters and are pointed in the direction of heaven. This is what Saint Paul means in our second reading today – if you have been resurrected with Christ, as indeed you have in baptism, then seek the things are above. Let your life follow that symbolic direction upwards by saying no to the things which weigh you down as Saint Paul says: “impurity, guilty passion, evil desires and especially greed” (Col 3:9); as Our Lord says in the Gospel, do not be weighed down by avarice. But there is a connection also with what we are doing now in this Church, in the celebration of the Eucharist. That baptismal rising which is the beginning of our Christian ascent, that liberation from the weight of sin, is nourished and strengthened by the Body and Blood of the Lord in the Holy Eucharist. The line from Saint Paul’s Letter to the Colossians which I have been quoting: “If you have risen with Christ, seek the things that are above”, in the Latin Bible, the Vulgate, goes like this: “si conresurrexistis Christo quae sursum sunt quaerite” – “quae sursum sunt quaerite” – the things that are above, seek them. But that Latin word for “above” or for “up” – “sursum” – connects us to the Mass because, in every celebration of Holy Mass, when come to enter into the profound mystery of Christ’s sacrifice, the priest calls out to the people: “Lift up your hearts.” In the Latin Mass, that same word from Saint Paul’s Letter to the Colossians is used “sursum” – “sursum corda” – just two words in the original Latin – “sursum corda” – hearts up! Every Mass then takes our baptismal rising further, every Mass infuses us with the love of God and re-energizes the spiritually upward movement of Christian life, as we journey toward the heavenly city, the new Jerusalem, which is described also by Saint Paul in his Letter to the Galatians as the Jerusalem above, the Jerusalem “quae sursum est” (Gal 4:26). The Eucharist is our food for this rising, this ascending, this climb upwards. Before I came to live in Ireland, I lived in Rome for many years where one of the most beloved saints is Saint Philip Neri, and one of the phenomena associated with Saint Philip Neri, and which indeed is depicted in paintings, is how he would actually levitate when he celebrated Holy Mass, a kind of miraculous symbolic confirmation of everything which we are reflecting on this evening. The Mass directs us upwards, symbolically toward heaven. And so all these ideas are in our minds this evening as we prepare for tomorrow’s pilgrimage climb of the holy mountain of Saint Patrick, Croagh Patrick, that mountain which has been a place of pilgrimage for Christians in Ireland for well over a thousand years. And again, how profound and how richly significant is our climb. We literally follow the paths traced by our ancestors, women and men of faith, who kept that faith despite the opposition they faced, despite poverty and discrimination and emigration and famine. On Croagh Patrick, we literally walk in their footsteps and we follow their trail. Brothers and sisters, let us follow them not only physically, but spiritually as well, by treasuring our Catholic faith even when we face opposition. Our pilgrimage tomorrow is also an experience of community. Yes, the life of the Christian has an upward trajectory, but we don’t ascend alone to the Jerusalem above. Tomorrow, we climb together, at the same time as others, as we do in the Christian life. We help one another; we watch out for one another; we make way for others on the trail. And on the summit when we arrive, we may want to confess ours sins and leave there the burden of sin we carry, so to be lighter and more at peace. Yesterday, a priest of your Archdiocese, Father Fintan Monahan, was named Bishop of Killaloe by Pope Francis. It is wonderful to have Bishop-elect Fintan with us this evening here in Westport. In his very well-chosen and inspiring words yesterday in Ennis, he mentioned Croagh Patrick and today’s pilgrimage, and used it as an image of the task before him as Shepherd of the Church in Killaloe: being a Bishop does mean having to climb a large mountain. When he said that, it made me remember saying something rather similar, some four years and a half years ago, to Paddy Agnew of The Irish Times when I was named Nuncio to Ireland. We wish Father Fintan the very best in this new and important mission which Pope Francis has given him. We can be sure that Our Lady, the Mother of the Lord, will obtain for him all the grace he needs to climb the mountain. “If you have risen with Christ, seek the things that are above” (Col 3:1). Sursum corda. The well-worn paths up Croagh Patrick are still there today. They haven’t disappeared. The path of Christian faith is still alive in Ireland in 2016. Perhaps at times we are tempted to be downcast, to keep our eyes down and our heads down. Even physically, many of us, and I include myself in this, have our heads literally down as we read our smart phones and type and text. But Jesus Christ is saying to each of us today: “sursum corda” – hearts up! Our lives on this earth are a preparation for the reality which we will profess in a moment, in the final line of the Creed – “the life of the world to come.” That life, that eternal life which is represented by the Jerusalem above, is already becoming present in our world today, in the sacraments of the Church and in the love and mercy we show one another. And so I say to everyone in Ireland, and in a special way to those who may have abandoned their faith because of scandals or discouragement or even just because of the relentless demands of modern life. I say to them: the ancient faith is true. God exists. He is rich in mercy. And Jesus of Nazareth is the way, the truth and the life of God himself. He is inviting you to follow him, to ascend with him, indeed to climb, with him as your guide. And he promises you the gifts of faith, hope and love, so that you will be able to ascend the mountain of your life and be made ready for the life of the world to come. “Seek the things that are above” (Col. 3:1): Sursum corda!